o Alex Matan, attained General at our club’s VE session 10/27, KN4QAH. He then passed his Extra. o Jerry Wilson, father was American Legion Post Commander in Florida, working on becoming a ham! • Final payment to Juerg’s widow will be in the next week or so. She will be moving to Switzerland sometime in December or later. • Icom 706, 718 and/or Yaesu 747: should we look into selling to buy another Icom 7300? • Discussion of membership fees for people hams under 18 years old. o Bylaws used to have a student & family fee but that went away with incorporation into Post. o Ray Whitehouse & John Wulf have one more year to serve in their two year terms. Ken: recent email from Berea Club. What happened to John Lewis, W4LEW? Will respond that he was here last month but not this. Ken will get in touch with John Lewis. 2002: business portion of meeting closed. • Was listening to a maritime net. During net, emergency interruption. Difficult to hear but appeared to be a ship with a sick person on board. NC did not know what to do! “I’ve got a book on that somewhere.” Lesson for all of us: keep in mind timely action you can take if you are ever NC or in the situation of needing to respond. Discussion re: what should we do if running one of our typical nets here => 911 is the best starting point and they can forwarded/pass on the information as appropriate. • Working on a 20 M Yagi beam. o Showed bracket, ham sticks, and some parts from MFJ that served as model for home brew, low cost version. 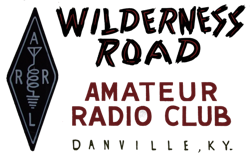 The WRARC held its regular monthly meeting at the American Legion Building on Spears Ln in Danville. Those attending were: KG4UQL, WD4LEW, KB4UPW, KF4FMQ, KA4SWT, KI6SER, KI6SEP, KG4VCR, K4FT, KJ4ND, KN4OHD, KY4RW, KY4KD, AC4NE, KM4TPW, W9WA, AND KM4QOY. The meeting was called to order by President Mike May at 7:32pm. Mike asked if there was a motion to dispense with the reading of the minutes since all received them by email. Bernie made the motion with John W 2nd the motion and all members approving. Mike then asked for a treasury report from Ken. He wrote a check to Chris for a banner that he had made for events for $50.00. Donation was made by Russell for $30.00. John W made the motion to accept the report. Bill 2nd the motion and all members approved. Mike asked George for activity report. George said that some club members participated in the Bourbon Chase. Janie and Andy will give a report on this a little later. Nothing is on for Oct since it’s about gone. John W said that we have a VE test session on Sat the 27th at 10am here at the Legion Building. George said the D Star net was Oct 1st with 9 states 28 check ins with one of those a nautical station in British Columbia. The next D Star net will be Nov 5th and Ken can give more on this. Ken said that this all started by a guy in Alabama. The gentleman wanted our Legion net to grow so he came up with drain Paul’s mad money. He said that he would give $1.00 per check in up to 25. Then Jack in Maryland said he wanted in on this so it has grown with the Post Commander, our club, Ken D, George C, Dennis and Peter sponsoring this event. The money will go to the Post for the Boys and Girls state program. It takes $200.00 for this and with the people that are donating we will get the full $200.00 toward this program. The boy which is a jr in High school along with his parents will be here to participate. George asked John W if he knew of any events in Nov. John said Nov 17th was a phone contest what should be fun so George said he will get it on calendar. Ken said he will not be able to attend so he would leave a key to get in. Bourbon Chase: All said had a good time doing this. John W said already mentioned but don’t forget the VE Test session Saturday the 27th if you want to upgrade. Mike asked about the Legion Thanksgiving Dinner. Ken said the Legion web site calendar should have it since it is up to date as is the club web site. Mike said we brought a dish last time a wondered if that was how it is this year. Ken mentioned that most all the items have been sold from Juerg’s estate and he plans on taking the final payment to her in a few weeks. The donations we received from members has allowed us to purchase the 7300 out right and not coming out of the club’s treasury. This was great that members stepped up and we got this done. Mike asked if there was a motion to close the business portion. John W made the motion and Peter 2nd all approved and the business closed at 7:50pm. been a big help as we were stretched thin. But all in all a fun event and we got the mission done. There were many other things brought up but not included in the minutes. Mike said elections are in November so start thinking. With nothing else motion was made to close all members in favor so the meeting closed at 8:23pm. KY4KD, N4JLT, KJ4ND, KM4TPW, KK4MJZ, KY4RW and K3KZU. The business portion of the meeting was called to order at 7:30pm by club President Mike May. Mike asked if their was a motion to dispense with the reading of the minutes since everyone has gotten a copy by email. Kenneth W made the motion with John L 2nd the motion. All members were in approval. for sale tab. Members can sell items that they have on the site just let him know. Mike asked for a activity report. Ken reported for George that could not make the meeting. Ken reported that the Legion Dstar net held the first Monday of the month was the biggest yet. We had 25 check-ins from 9 states. The net is being advertised on other nets. The Nov net will be the check in challenge. This has one guy from Alabama, one from NY, the Post 46 Commander and the club giving $1 per check in up to 25. This money will go to the boys and girls state program. The next Dstar net will be Oct 1st on 56C beginning at 8:00pm and members are welcome to come by the club station during that time. Janie reported that they had a somewhat meeting on what they needed the club to do for this event. She gave a power point presentation on the locations for setup and the operation procedures for this event. There was a signup sheet for shifts as this event will be Oct 12th running from 5pm to midnight. Chris and Doug said they would do the field station for the whole time. Many others signed up for slots. Still need more to help out. Mike ask Chris how it was going. Chris said no one has come to him for info. Mike said we needed to thank Bill for the laptop he donated to the club. Mike asked if any updates on this. Kenneth W said we have been ask to maintain security while we are there doing our events. The door to meetings will be locked as soon as meeting starts so members will have to knock to be let in. The other events such as contests, members need to knock on door or the window of the radio room. The only New Business was the Bourbon Chase that was presented earlier in meeting. No other new items. Dennis made the motion to close the business portion of meeting with Peter 2nd. All members agreed. Mike gave a presentation on a DIY J-Pole antenna he had made out of things he had laying around. He gave a list of parts and how he put it together. He did a test for SWR and had the findings which was very good across all VHF and UHF freqs. The meeting closed at 8:45pm with members hanging around to talk.